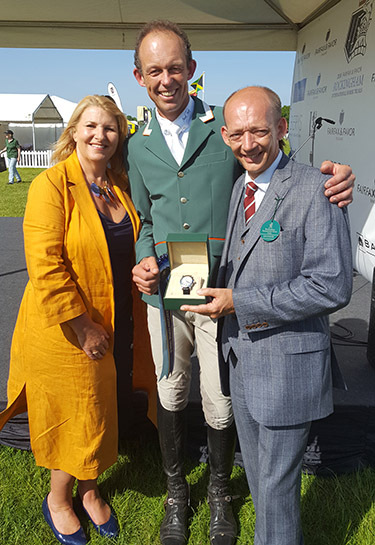 Jonty Evans (IRL) is this year’s Loomes Champion, winning a stunning Robert Loomes handmade watch as a result of finishing highest placed of the riders closest to the optimum time from the open and advanced intermediate competitors. Jonty and Cooley Rorkes Drift won the advanced intermediate in the process, coming home one second inside the time and finishing on their dressage score. “I was very aware of the prize,” Jonty laughed. “I came here for a good run after Badminton didn’t work out (Jonty and ‘Art’ were eliminated) so let ‘Art’ run on across country. He floated round and after jumping the last fence I had to put the brakes on a bit so as not to be too fast.” This result makes Jonty the second Irishman to win the Loomes Championship in its five year history. Bubby Upton won the Under 21 Open Intermediate class riding Peter Hollingsworth and Charlotte Bathe’s Mexican Wave, a horse Bubby took the ride on last summer. The pair upgraded to intermediate on their last run of 2017, and finished in the runner up spot at Belton Park’s U21 class last month. Elicia Miller and Charlotte Bacon completed the top three line-up, with A Sunny Bay and Cooley Enno respectively. Piggy French’s run of fortune continued further today, with Graf Cavalier winning an intermediate section. It is the third win of the season for Trevor Dickens’ mare who added just 2.4 cross country time penalties to their dressage score. Jessica Watts claimed the other intermediate on Sportsfield Adventure, the partnerships first win at this level. The final 3 winners of the event were novice combinations: Tom McEwen (Gladstone), Isobel McEuen (Kursk Root) and Andrea Clark (Murphys Bonanza).